When the power back door warning system does not operate, one of the following may be malfunctioning: 1) power back door warning buzzer circuit, 2) wireless door lock control system or 3) power back door ECU. door system after confirming that the communication system is functioning properly. 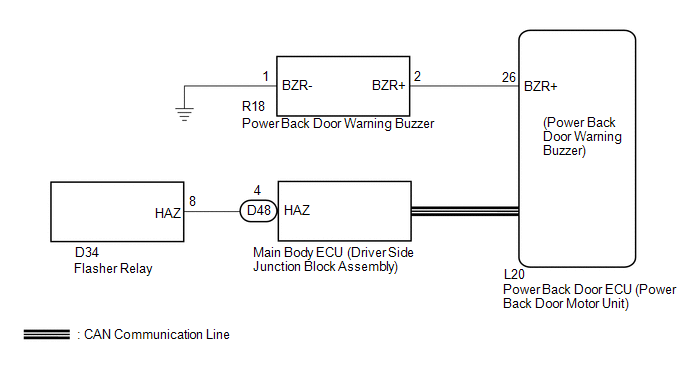 (a) Check power back door system operation. (e) Using the Techstream, perform the Active Test to generate a control command, and check that the power back door warning buzzer sounds. (a) Remove the power back door warning buzzer (See page ). (a) Disconnect the R18 power back door warning buzzer connector and L20 power back door ECU connector. (b) Disconnect the resistance according to the value(s) in the table below. (a) Check wireless door lock operation. (a) Replace the power back door ECU (power back door motor unit) (See page ). 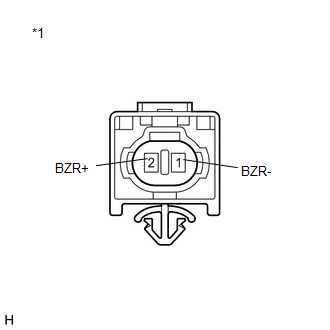 (a) Check that the power back door hazard warning lights operate normally (See page ). The power back door hazard warning lights operate normally.